Our year 2015 began with a lot of great and daft ideas which we want to put into action for and with you. We already started with the food swap „Trade Apple for Pear“, and right now, quietly and secretly we work on small and big alterations, actions and surprises. Right at the beginning of the year, we were surprised by our ranking at the German Food Blog Contest 2015! We are very proud of our first place in the category “Innovation & Lifeblood”, and are really happy to share the podium with three adorable bloggers, namely Lisa, Julia (Liz & Jewels), and Christine (Trickytine). 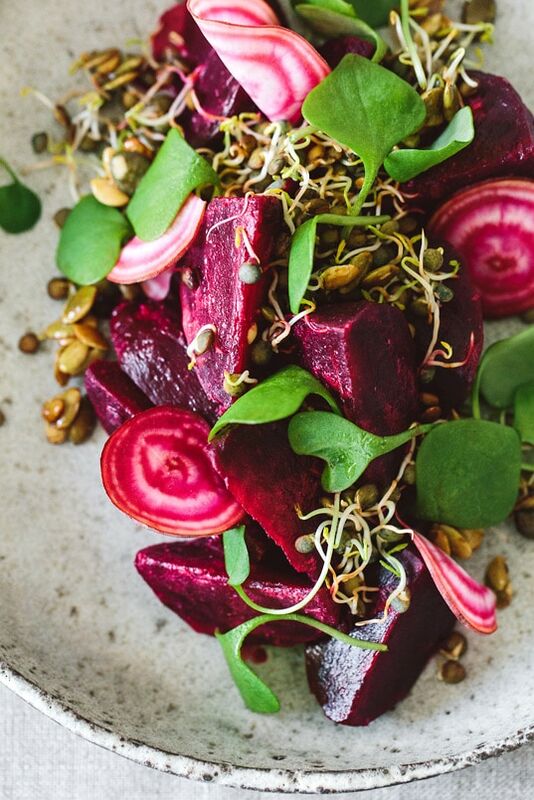 To celebrate this we created a beetroot menu, to which every one of us contributed a recipe and thus, a course. 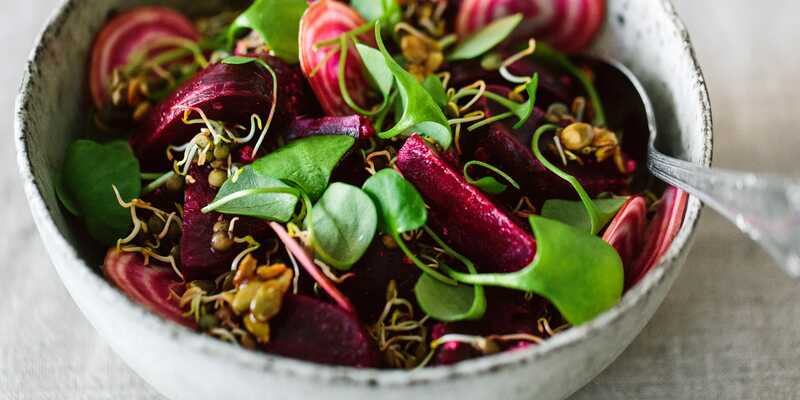 Let’s start with our beetroot salad with lentil sprouts as appetizer. Within the next two days you will find the main course at Trickytine, and Liz & Jewels conjure a sweet beetroot delicacy. Mark our words, it will be a feast! 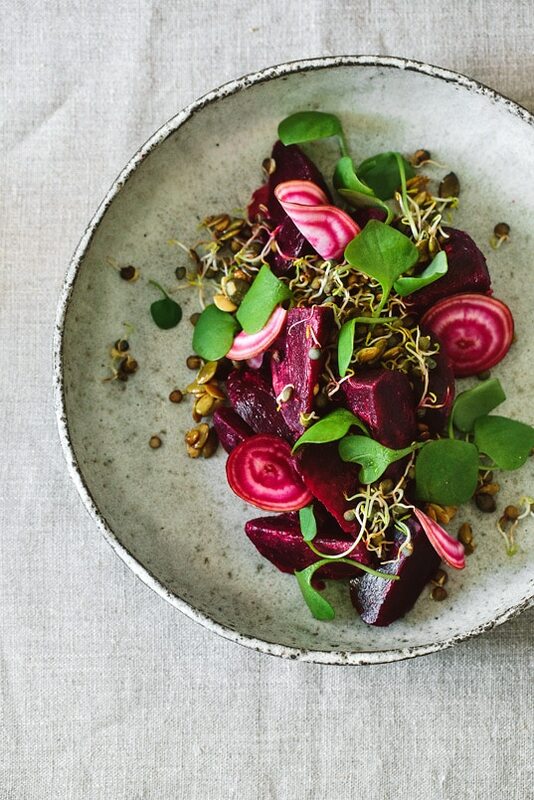 Beet root lovers will have their money’s worth. Take a seat at our table and let’s drink to further beautiful, exciting, and maybe even raving surprises! Awesome colours, super easy, and absolutely healthy. 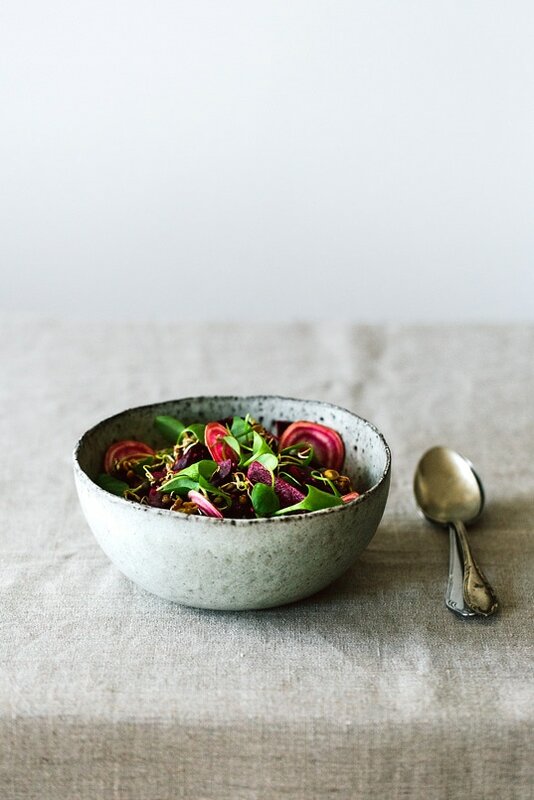 Say hello to our winter salad with beetroot and lentil sprouts. Especially in winter, when few fresh vegetables are available, we grow our own sprouts out of grains, seeds, and legumes. It takes prep time, since the lentils need about three days to sprout, but not only the optics and flavours, but also the health benefits are worth the effort. While sprouting, the nutrition levels rise. 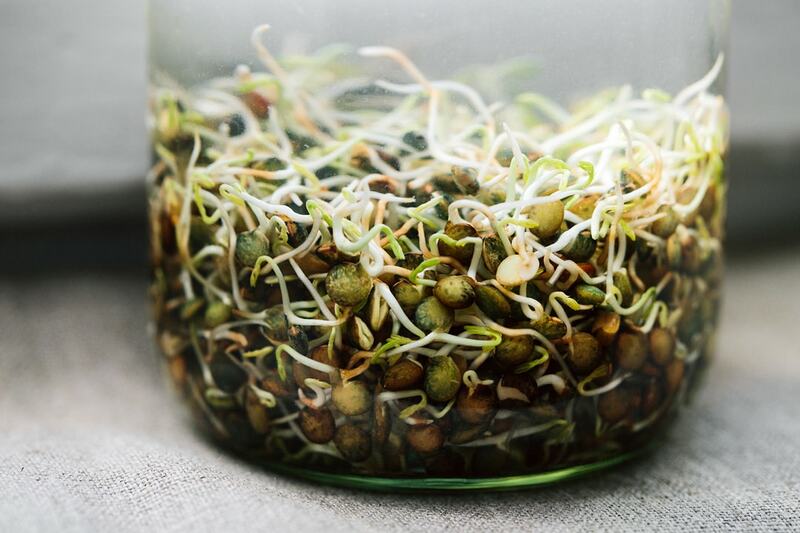 Lentil sprouts are rich in vitamins of the B group, vitamin C, potassium, magnesium, iron, zinc, and folic acid. We already reported the health benefits of water kefir. For the salad, we prepared a coconut yoghurt with milk kefir, which is, because of the ferment process, rich in healthy lactic acid bacteria and yeast funghi. Together with the beetroot they combine to a perfect vitamin and mineral bomb. Soak the lentils over night, fill them into a sprouting glass, and keep them in the dark the first day. Wash the legumes three times a day with lukewarm water, and let them sprout in daylight and at room temperature from the second day on. Wash the beet root thoroughly and bake at 180°C in the oven for about 60-90 minutes. Finely chop the shallot and garlic, and braise them in a bit of plant oil. Lightly roast the pumpkin seeds, add the remaining honey, and let the seeds caramelize. Spread them on a sheet of baking paper and let them cool down. 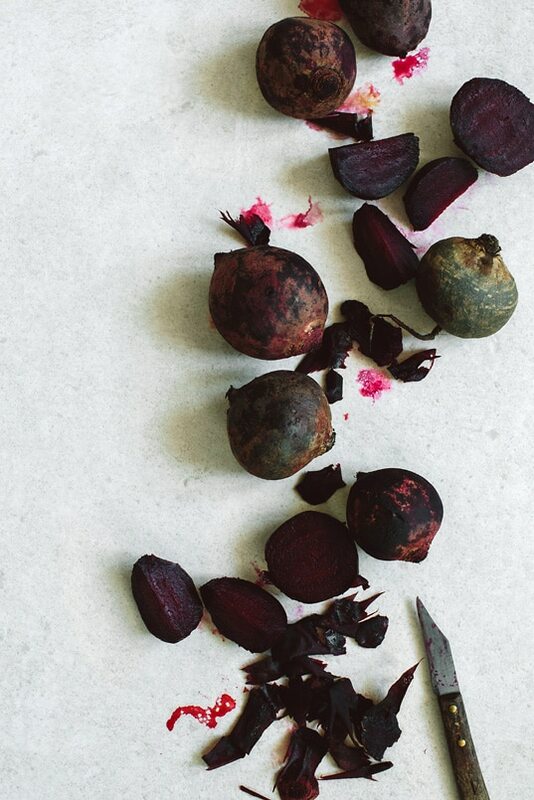 Peel the beet root, quarter or chop in rough pieces, and mix with coconut vinaigrette, garlic, and shallot. Shortly blanch the lentil sprouts and refresh them in cold water, since raw they should be consumed only in small amounts. Drain well, and sprinkle them with the put-aside dressing. 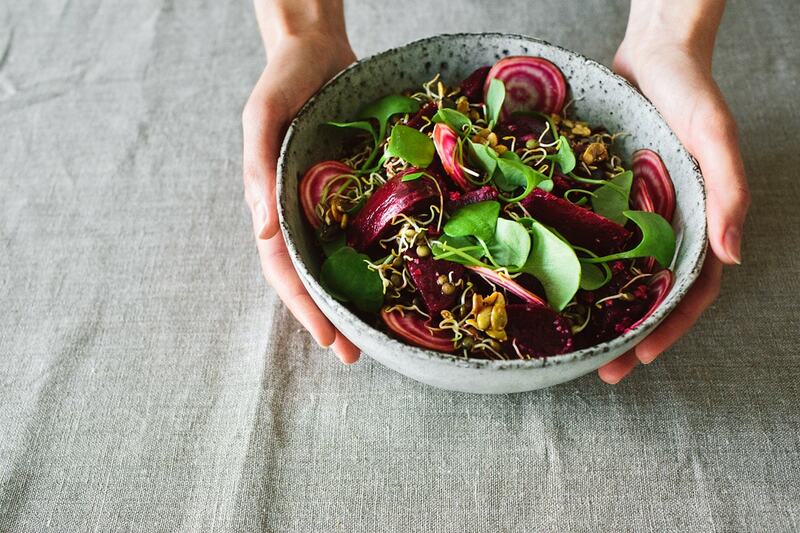 Slice the Chioggia beet, and together with the lentil sprouts, miner's lettuce, and caramelized pumpkin seed arrange them on the beet root salad. Komme gerade von unserem Wochenmarkt auf dem Platz. Zum Glück muss ich dafür nur aus der Haustüre “rausfallen”. Heaven on Earth.